James Brooke, VoA News: Mikhail Gorbachev turned 80 on Wednesday. In advance, Russia’s political bear gave himself a birthday present: he came out of political hibernation. After two decades of lying low and not tangling with the current occupants of the Kremlin, the last leader of the Soviet Union finally opened up. 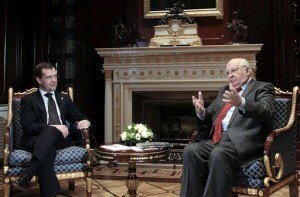 And Gorbachev didn’t stop there. The country’s “ruling class” is “rich and dissolute,” he said in an interview published in Novaya Gazeta, a newspaper he partly owns. In keeping with Russia’s ‘imitation’ democracy, few of his critical comments saw the light of day on Russian national television specials about his birthday. 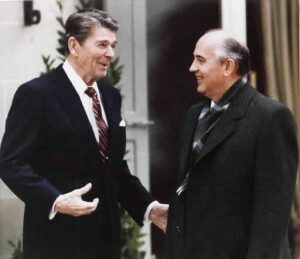 Every time, I’ve met Gorbachev over the years, here or in the U.S., he was a big talker, reminiscent of America’s ham fisted union leaders of the 1950s. But, he generally talked about his role in history, his relations with Ronald Reagan and Margaret Thatcher – not about current Russian politics. Now, some are saying that Vladislav Surkov, the Kremlin’s chief ideologue, flipped Gorby’s switch. Surkov, who is barely half Gorbachev’s age, told the former ruler of the Soviet Union that the Kremlin would not allow the registration of his social democratic party. 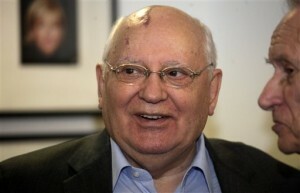 A hero in the West, Gorbachev evokes mixed feelings at home. In the West, he is revered for lifting from Europe and the United States the real threat of a nuclear weapons exchange with Russia. He is admired for presiding, in a dignified way, over Russia’s loss of empire – first the satellite nations of Eastern Europe, then the 14 non-Russian republics of the Soviet Union. But from the Russian side of the fence, the collapse of the Soviet Union was traumatic. Jobs vanished. Inflation consumed savings. Crime and ethnic violence erupted. Heath care services fell apart. Mortality rates soared. And, one day, each and every Russian eventually woke up to the realization that Moscow was no longer the capital of a superpower. Though the collapse of the Soviet empire was probably inevitable, Gorbachev has been made the scapegoat. Even so, many Russian now take for granted the freedoms that Gorbachev’s guidance eventually brought them – to travel overseas, to open a business, to buy Western quality goods inside Russia, and to freely cruise the Internet. The split view on this man who changed history came into sharp focus on his birthday. In Moscow, celebrations of Gorby’s 80th were largely confined to “Mikhail Gorbachev: Perestroika”, a historical photo exhibit near the Kremlin. When I went on his birthday at 4 pm, a large policeman gruffly told me the show closed at 3 pm. In contrast, a gala concert is planned March 30 at the Royal Albert Hall in London. The celebration is being organized to raise contributions for The Gorbachev Foundation, an entity that aids children’s cancer hospitals in Britain and Russia. Gorbachev’s beloved wife, Raisa, died of leukemia in 1999. The guest list includes ex-presidents and prime ministers, Hollywood actresses, financial leaders, and publishing tycoons. According to ‘Gorby 80’ the organizing committee, the glittering evening will be split into seven phases, each marking milestones in the trajectory of a man whose first job was driving harvester combines on a collective farm in the late 1940s.